Published in: J Scientometric Res. Cycles of Invention and Discovery: Rethinking the Endless Frontier, by Venkatesh Narayanamurti and Toluwalogo Odumosu. Harvard University Press, 2016, hardcover, 176 pages, ISBN 9780674967960. The processes of scientific knowledge production and technological invention are of crucial interest to the discipline of Science, Technology and Society studies (STS). 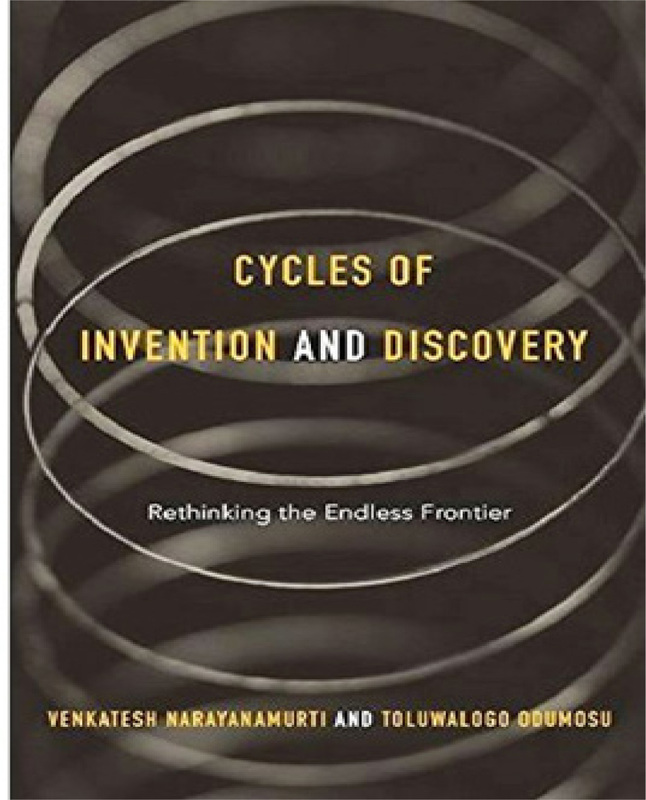 In the book, “Cycles of Invention and Discovery: Rethinking the Endless Frontier”, the authors have challenged the popular understanding of the processes of scientific and technological knowledge production and innovation. Science and technology are social institutions, affected as much by societal forces as they affect society. One such social, indeed political, factor upon which the central argument of this book is based is the utilization of categories employed in the classifcation of research activities for the purpose of state funding of research. The authors explain the need to recognize the futility of and the difficulties arising from the dichotomy that results from this categorization causing hindrance to the actual process of scientific and technological research. This dichotomy, the authors discuss, is embodied in the usage of the terms, ‘basic’ and ‘applied’ that have come to demarcate strictly the boundaries between fundamental and application-oriented research. The book analyzes the serious limitations of the language used in Science and Technology (S&T) policy-making in the United States of America characterized by static ideas and unchanging definitions of the terms ‘basic’, ‘applied’, ‘pure’, ‘science’ and ‘engineering’ (p. 17). The authors argue that this language has resulted in patterns of allocation and distribution of federal funds that pose significant challenges to the practice of science and engineering in the US. The authors trace the origins of this dichotomy to the historic report, Science, the Endless Frontier, written by Vannevar Bush upon the request of the US president, Franklin D. Roosevelt in 1945. Roosevelt had asked Bush for his recommendations on shifting the focus of science and technology from war to peacetime activities for the betterment of the American society post the two world wars (p. 3). In this resulting report, Bush had advocated the need to distinguish between the more fundamental ‘basic’ sciences and the ‘applied’ nature of engineering/industrial research. The authors begin by investigating the cause of this perceived distinction between ‘basic’ and ‘applied’ research, or in other words, between science and engineering/industrial research. They found that the history of the linear model of innovation is an important starting point in understanding the basis of this distinction (p. 21). According to this model, innovation is a linear process which begins with basic research, it then progresses through applied research and into product development and is finally, taken up by business and introduced into the market. This model implies that an innovation or an innovative product which is the outcome of ‘applied’ research is essentially rooted in basic research. In other words, science always comes before engineering. Hence, in order to improve innovation, investments should be made upstream in the linear model, i.e. increasing the funding of ‘basic’ research. It is this linear causality that the authors challenge by providing historical instances wherein inventions came well before scientific understanding and often lead to further inventions and discoveries. One such instance is the invention of the steam engine by James Watt before the discovery of the laws of thermodynamics (p. 27). In order to overcome the challenges posed by this linear model, the authors propose an alternative model in the form of the discovery-invention cycle (DIC). In this model, not only do they replace the divisive terms of ‘basic’ and ‘applied’ by the terms, ‘discovery’ and ‘invention’, but also show that in practice, research indeed comprises of both discovery and invention that are components of a dynamic cycle and inevitably draw upon one another (p. 48). This model has been based on the historical example of the Bell Labs of the AT&T Company whose institutional structure, and research organization often blurred the boundaries between science and engineering to give rise to Nobel Prize winning work. The first important outcome of this kind of integrative research at the Bell Labs was the discovery of the transistor effect and the invention of the transistor in the year 1947/1948 that was later awarded the Nobel Prize in 1956. This was an endeavour that included both scientists and engineers. The pathbreaking work on the transistor led to certain important discoveries and inventions that were critical for the development of the information and communications technology as we know it today. Two other such contemporary examples provided in the book are the Janelia Research Campus working on biomedicine, and the materials department at the University of California Santa Barbara working on the physical sciences and engineering. These three institutions exemplify the elements that are characteristic of an integrative research process comprising of both ‘discovery’ and ‘invention’ (p. 99). While the authors challenge the artificially constructed boundary between ‘basic’ and ‘applied’ research, they posit that the actual boundary must be drawn between research, an ‘unscheduled’ activity - and development, a ‘scheduled’ activity (p. 11). However, this boundary must also at best be porous. This particular kind of research culture, the authors claim, is best exemplified by the industrial research laboratories. The contemporary scientific and technological institutions could benefit from emulating such an institutional structure and research environment. The elements of the integrative research culture that emerge from this analysis give rise to certain policy implications. These policy implications are stated in the book and emphasize the need for research activities to be increasingly based on the industrial laboratory model, transdisciplinarity and increased collaboration and competition. In essence, the DIC is a model that shows striking similarities with the Mode 2 form of knowledge production. In the Mode-2 form of knowledge production, research is essentially inter-/trans-disciplinary and application-oriented, and hence, collaborative. The only difference between the DIC and the Mode-2 form of knowledge production is that the authors acknowledge that research within the framework of the DIC is an ‘unscheduled’ activity; an activity whose outcome and time frame cannot be predicted in advance. This is in contrast to the ‘scheduled’ nature of product development that comprises of well-defined objectives and specified time frames. The authors insist that in order for ‘discovery’ and ‘invention’ to flourish, the agencies that fund scientific and technological research must allow the researchers ‘the freedom to fail and the patience to succeed’ (p. 81). However, one of the main criticisms of the Mode-2 form of knowledge production may very well apply to the DIC as well. John Ziman, in an essay on post-academic science (a term used interchangeably with the Mode-2 form of knowledge production) had casted doubts on the status of ‘objectivity’, one of the scientific values linked to the Mertonian norm of disinterestedness, in the post-academic culture of science. Ziman had argued that within this post-academic scientific culture, where research is primarily application or use-oriented, there will be a dearth of instances to practice the ideal of objectivity; an ideal that gives science its social credibility and stature. This, in turn, may result in the gradual decay of the very objective nature of science. In the light of this view, it can be held that although objectivity in science is never absolute, the existence of such a scientific value could prove to be a reference point for judging the impartiality and unbiasedness of scientific interpretations of natural phenomena. In the DIC model of scientific research, the authors extol the industrial model of research and uphold the values of research collaboration. These forms of scientific activities are known to be extensively market-driven and goal-oriented. Even with a ‘broad’ mission and a lenient timeframe, can industrial and collaborative scientific research ensure the practice and the perpetuation of objectivity in science; and if so, to what extent? The authors of this book insist that the linear model of research, where research is categorized into separate ‘silos’, should give way to a more ‘holistic’ view of research embodied in the discovery-invention cycle (DIC). Although this is a welcome approach to the criteria for allocating research funds, the authors’ definitions of the terms, ‘discovery’ and ‘invention’ bear the same meanings as the terms, ‘basic’ and ‘applied’. However, the primary contribution of this book is to demonstrate in greater detail what other researchers have discussed previously, that is, “creation of new knowledge” (discovery/basic research) and the “accumulation and creation of knowledge that results in a new tool” (invention/applied research) are intricately interlinked and, using the language of this book, constitute a cycle. Copyright statement: Copyright: © J Scientometric Res.